ORLANDO, FL � Back in the fall of 1968, I remember sitting in front of my black-and-white television watching �The Wonderful World of Disney,� when Walt Disney described his plan for a new theme park in central Florida, set to open in the next few years, called �Walt Disney World.� The idea got a lot of people excited, and the Sunshine State�s never been the same since. Seeing his vision in place today, Mr. Disney would�ve been very pleased indeed with the 99 holes of golf now surrounding his theme park(s). When most people think �Disney,� they think mouse ears, animated films, cotton candy and Space Mountain. But placing those impressions aside, you should also think �golf� when you picture Disney World. 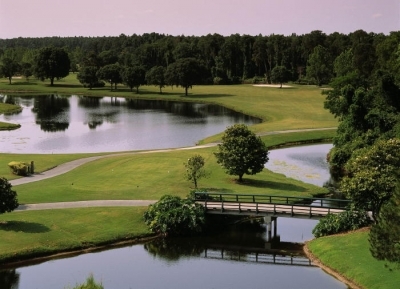 DISNEY'S PALM GOLF COURSE -- The natural beauty of Florida woodlands makes the Palm not only a pleasure to play but also one of Walt Disney World's toughest. Rated one of Golf Digest's "Top 25 Resort Courses," this Joe Lee course measures 6,957 yards from the back tees, 6,461 from the middle and 5,398 from the front. With greens recently rebuilt from the drainage basin up, this course is perhaps better than new. Save a sprinkle of pixie dust for No. 18 -- it's been rated as high as fourth toughest on the PGA TOUR. Walt Disney World Resort has grown into a world class golf-vacation destination, with five championship-caliber courses complimenting the already famous entertainment offerings. Covering 775 acres of the total 47-square mile property, Walt Disney World is one of the largest golf resorts in the country. We already know of the vast hotels and theme parks that Disney offers its millions of visitors each year, but the entertainment mega-plex has also earned a reputation as one of the great golf havens in the entire United States. Professionals share the high opinions of Disney golf. Each year since 1971, the PGA TOUR has called Walt Disney World home for one week in October. 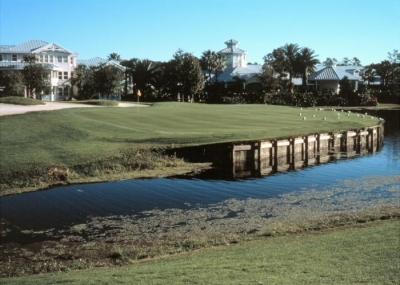 The Walt Disney Classic is played on two of the resort�s courses, the Magnolia and Palm courses. 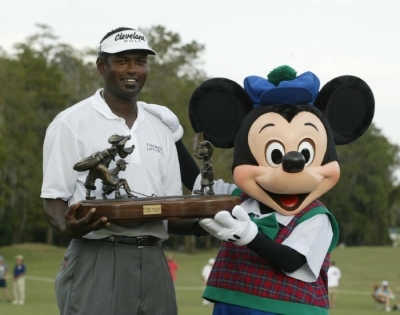 Oct. 26, 2003: 2003 Funai Classic winner Vijay Singh with Mickey Mouse at the trophy presentation after Sunday's final round at Walt Disney World Resort in Lake Buena Vista, Fla. The �other� courses are, Osprey Ridge, a 7,101 yard par 72, designed by Tom Fazio. Fazio always said this was one of his best. Eagle Pines, just south of Osprey Ridge, is a stark contrast to Fazio�s creation. 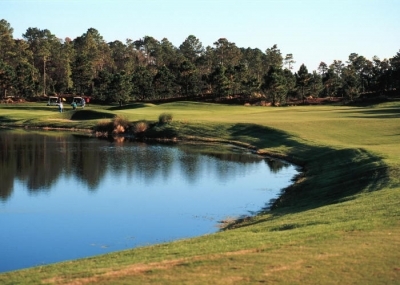 At 6,772 yards, Eagle Pines offers the golfer a challenging round of golf. Eagle Pines is very visually intimidating to both the average and scratch golfer, so be careful when taking on this lovely course. The Magnolia course opened in October 1971, and instantly became home to �The Walt Disney World Classic.� In true PGA TOUR style, this beautiful course has all the earmarks of a golfer�s paradise. With its rolling terrain, elevated tees and greens and yes, even a Mickey Mouse bunker, this Joe Lee designed course is one of the favorites at Walt Disney World. DISNEY'S MAGNOLIA GOLF COURSE -- As one of the two original Disney golf courses, the Magnolia opened in October 1971, and immediately became home for the Walt Disney World Golf Classic. In true PGA TOUR style, this beautifully manicured course has all the earmarks of a golfer's paradise: Elevated tees and greens, rolling terrain, and a very special bunker on the sixth hole in the shape of you-know-who. The Joe Lee-designed course is aptly named for its over 1,500 magnolia trees. The Palm course, another Joe Lee designed masterpiece, measures 6,957 from the back tees and is probably the most difficult course at Disney. It�s rated as one of Golf Digest�s �Top 25 Resort Courses.� But look out golfers � it�s been rated as high as fourth toughest course on the PGA TOUR! Lake Buena Vista, built in 1972 (also designed by Joe Lee), features narrow fairways and native foliage looms close on every hole. 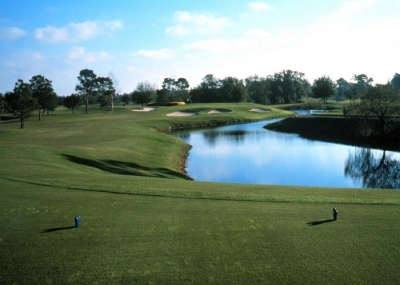 Measuring 6,819 yards from the championship tees, this course is located near Downtown Disney. Don�t miss out on Oak Trail, a par 36 executive golf course, the perfect quick nine for the beginning golfer or just for a leisurely practice round. 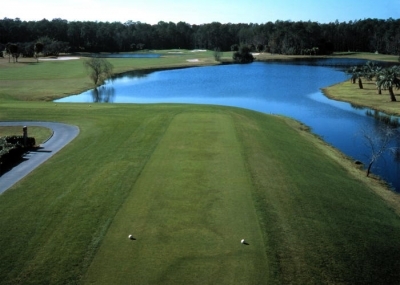 DISNEY'S LAKE BUENA VISTA GOLF COURSE -- Built in 1972, Disney's Lake Buena Vista Golf Course stretches to 6,819 yards from the championship tees. LBV is a tough challenge to many, as native foliage looms close to the narrow fairways. The course is somewhat more forgiving from the middle and forward tees which measure 6,268 and 5,176 yards, respectively. 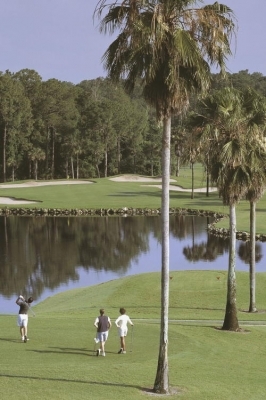 The Lake Buena Vista course is located near Downtown Disney and Disney's Old Key West Resort. If rounds on a subsequent day are at a different Disney course, the golf service staff can arrange club transfer and storage at the other courses. HEADING FOR HOME -- The par 4 No. 18 on Disney's Eagle Pines course completes an adventure on a unique low-profile layout designed by famed course architect Pete Dye. It plays 414 yards from the tips. Relax at one of more than a dozen themed Disney resort hotels, offering comfort and convenience for luxury-seeking and value-minded vacationers alike. The choices range from the turn-of-the-century opulence of Disney�s Grand Floridian Resort and Spa�to the whimsical movie themes at Disney�s All-Star Movies Resort. There�s a world of imaginative themes, including my favorite, the Polynesian Resort; a quaint New Orleans re-creation at Disney�s Beach Club Resort; America�s rustic national park hotels at Disney Wilderness Lodge; charming New England seasides at Disney�s Yacht Club Resort -- and more hotel rooms coming each year. Room rates start at $80.00/night depending on the month of your visit and hotel choice, and the price always includes a golfer�s easiest drive of the day, from the hotel to one of Disney�s five championship courses. While at Disney you can sample the other recreational adventures abounding throughout Walt Disney World Resort. If you�re parasailing above Bay Lake, you�re taking in a view of the Magic Kingdom usually reserved for eagles or birdies� (which I don�t get many of any way). Or even try surfing the waves at Typhoon Lagoon water-park... Or fish for that lost golf ball� Or take a tennis lesson� Or scubadive in the world�s largest saltwater environment outside the Pacific Ocean at Epcot Center. 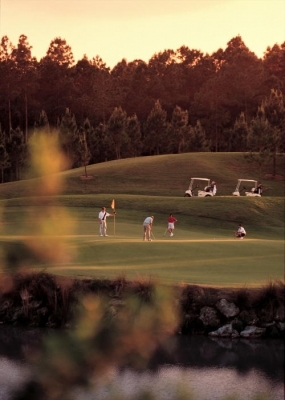 DISNEY'S OSPREY RIDGE GOLF COURSE -- Osprey Ridge is a course unlike any other. With uncharacteristically rolling Florida terrain, Osprey Ridge is enjoyable for the resort guest as well as the accomplished professional. Located in the northern section of Bonnet Creek Golf Club, Osprey Ridge is 7,101 yards from the back tees. Not exactly your run-of-the-mill vacation, is it? While you�re enjoying your day, you�ll be able to dine at a virtual smorgasbord of restaurant choices. These delectable selections include the California Grill, Wolfgang Puck�s Caf� and the Flying Fish Caf�. You can choose from over 300 dinning locations, with your options ranging from wings or burgers at the sports clubs to some of the best international cuisine found anywhere on earth. Or how about getting a spa treatment at the Grand Floridian�s Spa and Heath Club? TOWERING PALMS add to the beauty of Disney's Palm Course, a challenge for amateurs and pros alike. In October, PGA TOUR players tee it up on the Palm during the FUNAI Classic at Walt Disney World Resort. The rest of the year, the Joe Lee-designed layout is available to resort guests as part of Disney's 99 holes of golf. Here golfers test the par 3 No. 16. Don�t forget the Disney parks � there�s fun for every age and interest. Choose from Epcot, MGM, The new Animal Kingdom, and for all of us eternally still-a-kid-at-hearts, The Magic Kingdom. Each of these parks has a value all its own -- and if you are two or eighty-two, you�ll find a park you can call your own and enjoy your entire visit. Continuing Disney�s commitment to the environment, all the Walt Disney World golf courses have achieved designation as �Certified Audubon Cooperative Sanctuary(s)� by the Audubon Cooperative Sanctuary System, the educational division of Audubon International, endorsed by the United States Golf Association. The designation is achieved by �maintaining a high degree of environmental quality in a number of areas,� according to Joellen Zeh, staff ecologist for the Cooperative Sanctuary System. Disney also has many things that the golfer can choose from while staying in Orlando. Private or group golf outings or instruction is available, along with Junior camps offered during the summer. Convenient transportation to all courses for Disney guests, to and from your hotel. Club cleaning, storage and transfer are also available. CUTTING CORNERS - Golfers on the tee at No. 17 of Disney's Magnolia Course need to know the carry of their drives and proceed accordingly. The green of the par 4, Joe Lee-designed hole is hidden behind trees at the upper left, meaning there's an opportunity off the tee to shorten the approach. However, there's also a risk: a longer carry over water. The Magnolia has hosted a PGA TOUR event annually since 1971 tenth longest current streak among TOUR courses. Tee times can be made by calling 407/WDW-GOLF (4653), or click on www.disney.com. Guests with a resort confirmation can reserve up to 90 days ahead. Daily visitors can book up to 30 days in advance. Walt Disney World Resort in Orlando, Florida is home to Mickey, Minnie and Tiger -- well, he�s there at least one week out of the year. Take time out this year to go and visit one of the country�s favorite family destinations and take in some of the best golf anywhere. For more information on golf at Walt Disney World, try: www.wdwgolf.com, or www.disney.com.